Comfortable vacation rental on Topniska Street is situated less than 2 km away from main square in the historical centre. The apartment is on the 15th floor with elevator access and offers glorious view from its balcony to the city castle on one side and mountains on the other. It is a few minutes far away from the main exhibition ground Gospodarsko razstavisce, Medical center, main bus station and railway station. 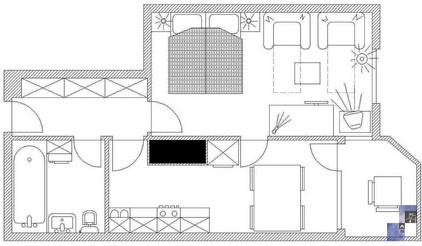 This one bedroom apartment has a bedroom with two twin beds together with living area, where are two armchairs, which fall down to a bed (90 x 200 cm each) and writing desk. Large kitchen is equipped with stove, oven, microwave, dishwasher and big refrigerator. In the bathroom there are washbasin, bath tub, toilette and washing machine. It is fully equipped with cooking utensils, cutlery, towels, linen, iron, ironing board, hair dryer, telephone, CATV, free broadband wired and wireless (Wi-Fi) internet access, air conditioning. There is a payable public parking space in front of the building. We have had a fantastic time in Ljubljana. The apartment has been perfect for us, especially the view over the city that offers. Ljubljana is a very beautiful city with friendly people and a great food and restaurants. We thank apartmaji for our stay in apartment Helena! The nightlife have been really good, but that was the only thing we experienced so we will have to come back. And if we are lucky we can stay again here, at Helena.